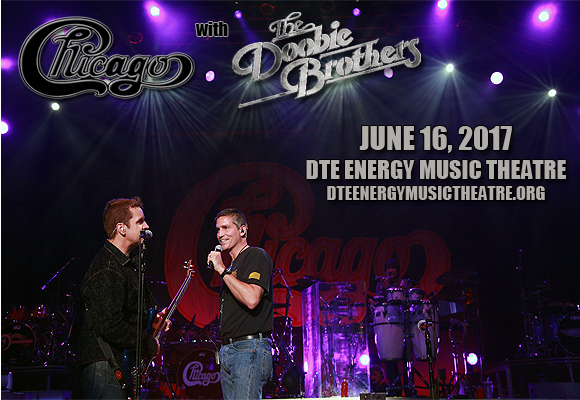 Legendary classic rock bands Chicago – The Band & The Doobie Brothers are heading to DTE Energy Music Theatre on Sunday 16th July 2017 as part of an exciting co-headliner tour that sees the two iconic groups on the road together! "We are so excited to once again be sharing the stage with our wonderful friends Chicago! They're a great band, and musically we fit together very well,” said Tom Johnston of The Doobie Brothers. “We know from past experience what a great show this is going to be for the audience. I'm sure there will be some fun musical surprises along the way too. It's going to be a great summer," adds Patrick Simmons. Second only to the Beach Boys in in Billboard singles and albums chart success among American bands, and with a steady strem of hits throughout the 1970s and 1980s, "rock and roll band with horns" Chicago are one of the world's best-selling groups of all time, having sold more than 100 million records. Since they formed in 1967, they have sold over 40 million units in the US, with 23 gold, 18 platinum, and 8 multi-platinum albums, and were the leading US singles charting group during the 1970s, according to Billboard. The band has had five number-one albums and 21 top-ten singles to date, and they were inducted into the Rock and Roll Hall of Fame on April 8, 2016 at Barclays Center in Brooklyn, New York.